At this point, we have defined the concepts of Introversion and Extraversion, and linked them to the definitions of Subjective and Objective, respectively. Other synonyms for these concepts are Personal and Collective, and correspond respectively. 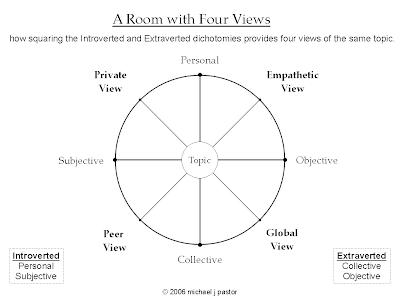 If we intersect and "square" these concepts and graph them, we end up with four quadrants that create an interesting model - what I call a "Room with Four Views." The labels I've assigned to these quadrants are pretty "off the cuff" and maybe someday I'll come up with better terms.